I'm on my way over there with my camera and ready to shoot our first video. My girlfriend Kelly cheerfully announced. No. I'm Not Ready, was my immediate retort. Well girl, just look at it as if you will just be cooking for tonight's dinner. You could do it. You could do it! Four powerful words that sparked enthusiasm and excitement. Before I knew it, I was giggling with her, in front of the camera like we were just having fun. And this my friends is what I would like to present to you... my first collaborative work with Kelly. Thank you Kelly for the encouragement, the tips, and for shooting this video blog. And as I mentioned in my May 29 post... Thank you for being a friend. Thank you for watching. Let me know what you think. xo, Malou P.S. I have shared the recipe of Fried Chicken a la Jollibee in a previous post. I hope you don't mind if I'll just direct you there to get the whole recipe. Please click here. yum yum yum. i miss Filipino fried chicken!! lovely to see your vids, Tita G! oh my oh my... you definitely are putting it a notch higher. go go go Malou! hahah you are hilarious but thanks.. I'm doing this for you hehe! If honestly, I don't have a sound on this PC. But the great thing about your video is that even without sound I could see and understand how much what products you are using and what you are doing! I love it! Uy, ganda ganda!!! Love your voice, ading ko. I love you, Sabado. Pati na rin Linggo. Hintay ka lang Jollibee nandyan na ako... Panlsang Pilipino, at home sa Jollibee! I was singing the song in my head too while reading your comment Sandy. You made me smile :). I hope to see you stop by again. I hope you continue to make videos. You are a natural artist. You certainly have a place on YouTube or on a TV show. I learned a new trick and thank you for sharing. Ms. Malou, if you could put the measurement in text here would really appreciate it, sometimes i would rather read then watch because it makes me have problems when i compare my work to yours, and it turned out to be unsuccessful for i would wanted my work to be exactly replica as yours. would really appreciate it, i miss that chicken joy in philippines so when i got your update i was so eager to learn the recipe so i could make it and serve it to my family. thanks in advance. I really enjoyed that, Malou. You should be in The Next Food Network Star. My children love Chicken Joy, too, and that really looks like it. I could imagine the aroma. Crispy, too! You are tease. aww thanks Adora but no, that's not my place hahah. I'm content with my skip to malou blog haha. Great job, Malou! And this comes from someone who has been in front of (and behind) the camera before. While my grandmother's fried chicken is our family's favorite, I might have to give your recipe a shot once it gets cooler in San Diego. - It would be helpful if the recipe was also included in text format. - Try using a clip-on (AKA lavalier) or shotgun mic next time as it makes the audio more crisp. If your video camera has a mic input, it's as easy as ordering a cheap clip-on or shotgun mic online. Thank you so much for all the tips that you have shared. I truly appreciate your generosity in sharing those tips to me. I need a lot of polishing but I know you guys are forgiving haha. I will work on making it better. Thanks againg and warm hugs to your baby! thank you , thank you! But I Agree with Lorena - a text recipe would be very helpful! Thanks again, I will re-edit the post. I hope you could try making chicken joy for you kiddies. Are you back or still having fun under CAli sun? Hi Malou. Our place is strategically located near Jolibee, McDo, Chowking, KFC, Mang Inasal, Shakey's, etc. which all serve popular chicken dishes so fried chicken is usually not among my usual menus at home. And honestly, I become disappointed when I don't get the expected outcome despite the many breading mixes I've tried. Your video gave me a new hope :) Just one question--- can you share with me what you do with the excess oil? because that's another reason why I don't like to deep-fry. Gosh, you're a natural in front of the camera. The video was great! I love seeing things when learning a new technique. Only downside, though - and this is just me - is I can read a recipe much quicker than the time it takes to watch a video. But I think most people prefer the video. Good work! 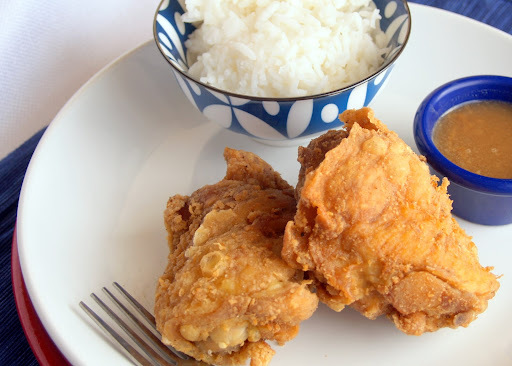 Hi Malou, love your Filipino style fried chicken, which is so crispy and delicious! Your video is really great...you're a 'natural' as I told you before. It's a bit too long though, just for simple fried chicken demo! Also, please don't suggest to your readers to add water to the oil to test the heat; it could be very dangerous by splattering grease in one's face...rather, add a few crumbs of the frying batter! I should put that in a mental note. I know I've been doing that dangerous act for years hahah. thanks for the reminder. Gosh, this is good. I’ve been missing the whiffs of golden fried chicken at JB’s – so glad you posted this recipe for it. thanks Adrian, it's only now i see t his comment hihi! Is five spice required? If not, what could be the best alternative spice/s I can use? Five spice is an important ingredient in this recipe as it gives you the "hint" and similarity in terms of taste with that of a Jollibee Chickenjoy. Five spice is usually sold in packets or a small jar and is readily available in any Asian specialty grocery store. Thank you for your question and good luck. Let me know if you need further assistance. Clap. clap. clap.. greetings from tuguegarao. I will surely try the "5 spice powder" with chicken... I have that in my kitchen but i did not know where to use them... Your chicken joy is perfect!!! Thank you for sharing!!!! Hahaha Lian, alam na alam ko ang tone ng voice mo kahit na naka sulat lang dito heheh. Salamat sa iyo. Kamusta ka. Na? Glad to hear from you. You your chicken joy recipe looks very good and i am very sure it taste good too just as our "chicken joy". I have this 5 spice in my kitchen but i did not know where to use it.. Thank you for sharing. 2ndly, you also looked perfect. i really love the video, hope if i make this it would be a great success. Thanks a lot for sharing. Awesomely love it! ilang lemon po ang kailangan sa 6 pcs. chicken?? thank you po. 1/2 to 1 lemon should be enough. you don't want to overpower it. so if you want it lemon-y wild, 1/2 is fine. do you have a recipe for the gravy?? Hi Malou I really like it..but I want to seecthe chickenjoy sauce as kn Jolibee please..thank you.. Thank you for stopping by and oh I would be thrilled even more if you could leave a comment... :) Cheers! Malou Nievera is the creative driving force behind the food blog, Skip to Malou, named one of Babble’s Top 100 Food Mom Blogs. She acts as the blog's recipe developer, writer, cook and photographer. She shares her easy and simple recipes with a focus on Filipino food. She also shares her recipes in her YOUTUBE channel, SKIP TO MALOU COOKING WITH A FILIPINO ACCENT. Thank you... I made it!